John Adams : Surfboard Riding on the West Coast, Africa, 1823. At the coastal villages of the Fantee, John Adams writes of the children amusing themselves in the ocean in terminology that replicates many reports of surfriding from Polynesia. On "pieces of broken canoes, which they launch, and paddle outside of the surf, when, watching a proper opportunity, they place their frail barks on the tops of high waves, which, in their progress to the shore, carry them along with great velocity." That the surfboards are "pieces of broken canoes," is highly significant. The recycling of broken canoes, most likely splitting longitudinally and with the timber already finished, as surfboards would appear to be reasonably obvious. In the Ellice Islands, Kennedy (1930) notes that the puke (the shaped bow-covering of the canoe) is used as a surfboard, and Bligh (1788) reported the Tahitians surfriding on the blades of their canoe paddles. (This last case was probably an abberation, given the extreme surf conditions running at the time; during this week every suurfboard in Matavai Bay would have been in high demand). Adams identifies the essential skill in a successful ride following the take-off; maintaining the board's postion in curl of the wave. "the principal art of these young canoe-men consists in preserving their seats while thus hurried along, and which they can only do by steering the planks with such precision, as to prevent them broaching to ; for when that occurs, they are washed off, and have to swim to regain them." Again, similar to Polynesian accounts, the children, "not more than six or seven years of age," swim expertly, and surfriding is community occasion, the best rides receiving " the plaudits of the spectators, who are assembled on the beach to witness their dexterity." After capsizing in a canoe in the surf, "an old man, apparently seventy years of years, swam alongside of" Adams and supported him until he was helped back into the canoe, whereupon the old man swam back to the beach. Not suprisingly, Adams commented "these people, like those of the windward coast, are almost amphibious." "The Fantees' are a people of West Africa inhabiting the coastal district of what is now Ghana, between the Ashantees and the sea. They were at one time the most numerous and powerful people situated immediately on the Gold Coast seaboard; but their power was almost entirely broken after 1811 by repe..."
- www.encyclo.co.uk/define/Fantees?, viewed 21 June 2013. John Adams entered the Royal Navy.in 1806, reached the rank of captain in 1843, and died in 1866. 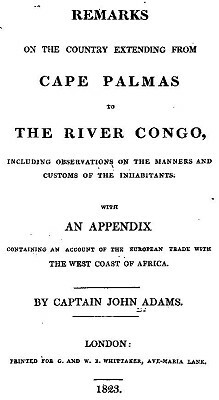 In the brief introduction, Adams suggests that the object of his book is to identify a suitable site for the repatriation of ex-slaves to West Africa, hence the detail of his observations. The idea was not without precedent, following the abolition of slavery.in the Britain 1807, the African Institution failued in its attempt to found such a colony at Sierra Leone. The colony of repatriated slaves at Adams' nominated site, Malemba, did not eventuate. His interest in the plight of ex-slaves may indicate an upbringing in one of the Christian denominations that actively campaigned for its abolition in Britain. A review of the book appeared in The Philosophical Transactions of the Royal Society for 1823, pages 387-407. Largely comprising extended quotations, the reviewer's response was less than enthusiastic. Extended selections from the book were published by The Monthly Magazine:Or, British Register, London, Volume 55 July Number 384 1823, pages 572-597. The price was 7s 6d. Extracts were also printed in the London Literary Gazette (1823), and these were later reprinted by Galignani's Magazine and Paris Monthly Review, Volume 5, August 1823. None of the extracts reprinted Adam's account of surfriding in West Africa. on on board their vessels, but few of them ever go on shore, and I was in consequence anxious to pay the town a visit. On making my intention known to the natives, they seemed much gratified, and placed me in one of their best canoes for that purpose ; from which we landed, without being much wet, the surf on the shore being moderate. danger of being drowned; and as soon as he had seen me safe in the boat, immediately returned to the shore. These people, like those of the windward coast, are almost amphibious. extending a few miles from it into the interior, and the latter a great extent of territory north of it. to swim to regain them, while their more dexterous companions reach the shore amidst the plaudits of the spectators, who are assembled on the beach to witness their dexterity. Little urchins, of not more than six or seven years of age, amuse themselves in this way, and swim like ducks. The mouth of the river is very shallow and dangerous, and many boats belonging to English vessels, with their crews and cargoes, have been lost in entering it. pay the portage to the town. They also warp the fresh water for the use of their vessels through the surf, rather than risk the lives of the seamen by sending them for it in boats into the river. Geoff Cater (2013) : John Adams : Surfboard Riding on the West Coast of Africa, 1823.